After we already had spring temperatures up to 19 degrees C last weekend, winter thought this really is pathetic and decided to come back for some extra time. It was snowing pretty hard for about 2 days – then we got a bloody cold night with temperatures around -15 degrees C. When I got up the next day and drove to work, the landscape just looked fantastic. All trees were coated with ice crystals, the sun was shining and the sky put on the best blue in stock. Now there was something really interesting I discovered on that day as well. I had taken a banana to work the day before, but had forgotten it was still in the car. Trust me, the banana was yellow. Not green, not brown – it was yellow. However, during that freezing night, an interesting metamorphosis must have been happening. 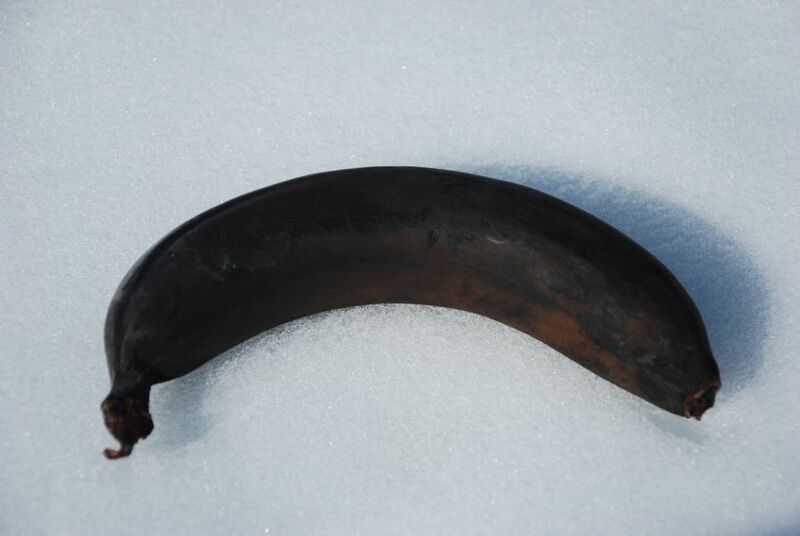 The banana turned dark brown – or to be honest, it almost turned pitch-black. It looked pretty much like the bananas you get when you wrap them in aluminium foil and chuck them into the fire for a while to enjoy them with vanilla ice cream and honey afterwards. On the weekend, we took Zipflbob and his girlfriend, Zipfljo, out for some winter hiking. We thought it would be a good day to show them the Zipfbob god monuments. They are really famous, but Zipflbob had never seen them before. We continued our walk and came past a huge caterpillar, which was parked next to the track. Zipflbob got very excited and in the 5 seconds when we didn’t pay attention, Zipflbob was already on his way. Luckily, there were no keys left, so we got him off the drivers seat before he could do anything stupid. A little further on our way, we discovered some snow-capped conglomerate rocks, which are called Nagelfluh. We explained to Zipflbob that these rocks were formed long before he was born. I think he was very impressed when he heard that a nature reserve called „Naturpark Nagelfluh“ would be created soon. After about an hour and a half, we got to the top and Zipflbob took in the view. He loves the mountains and he was happy to come up here and enjoy the 360 panorama with his girfriend, Zipfljo. They moved close together and Zipflbob told Zipfljo that he loved her and wanted to be with her for his whole life. He said that he wanted to have many many Zipflbob kids with her and then also take them up here. They kissed and then prepared for the downhill ride home. The runs were in top condition and since there were few people on the slopes, we allowed Zipflbob and Zipfljo to go full speed. It was heaps of fun and some of the best Zipflbob riding we’ve done this winter. Zipflbob, Zipfljo – YOU ROCK! 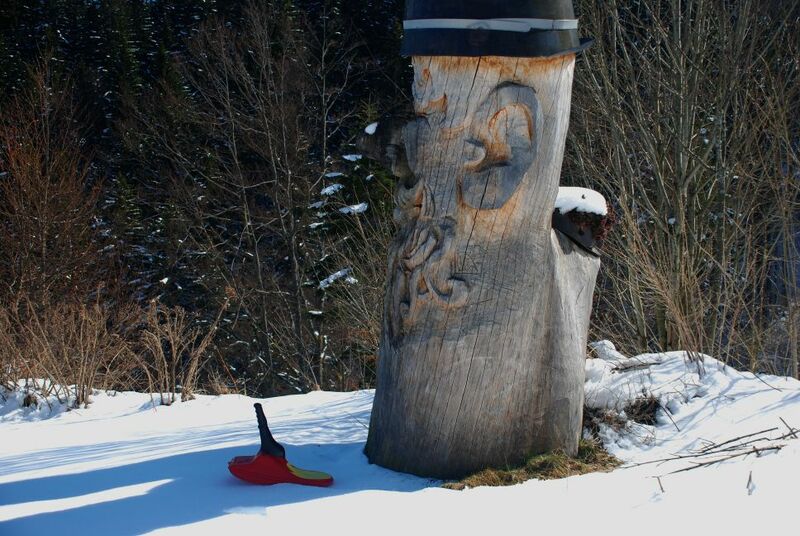 Dieser Beitrag wurde unter Mountains, Snow, Walk, Winter, Zipflbob abgelegt am 9.3.2008 von admin.